Happy Hideaway cabin is located on a quiet street in Pinetop Lakes. The natural beauty of the White Mountains surrounds you on a beautiful lot full of tall pine and oak trees. The Happy Hideaway has been beautifully decorated and is complete with all the comforts of home. Wake up in the morning and enjoy the cool weather with a cup of coffee on the deck. Gas burning fireplace, tongue and groove pine ceilings and open stairway to the upstairs loft complete the cabin feel, yet the home has all the modern amenities you want to thoroughly enjoy your stay. Close enough to all the local services to be convenient but away from the hustle and bustle. This roomy cabin sleeps six comfortably. Queen size bed sleeps two in the downstairs master, queen size bed sleeps two in upstairs bedroom and two twin beds in the other upstairs bedroom. Beds come complete with luxury linens, pillows and comforters. Wireless Internet available at no additional charge. Less than 200 miles from Phoenix or Tucson -- come up and enjoy the cool climate and escape the desert heat or play in the snow! 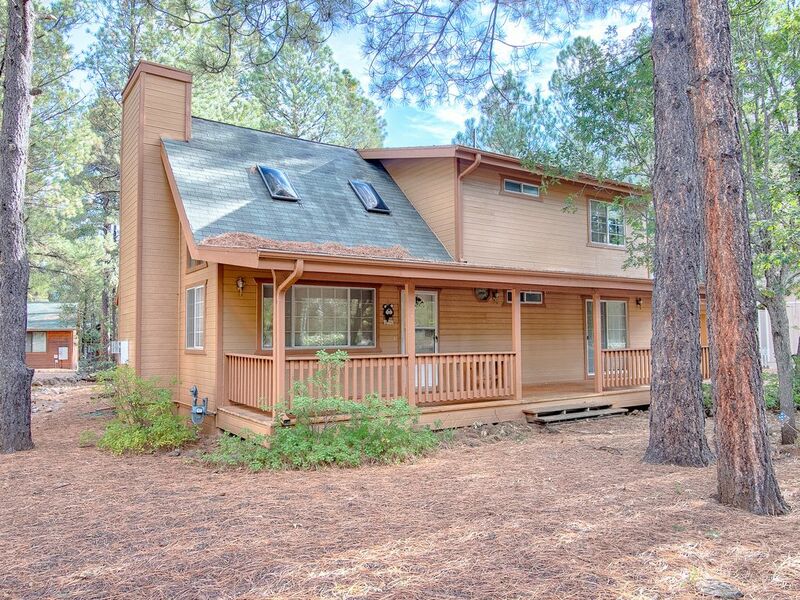 Keywords: 3 bedroom, 2 bath cabin in popular Pinetop Lakes area. Only 1/2 mile from two golf courses, 4 miles from Hon Dah Resort, close to trails for hiking and horseback riding. Only 30 miles from Sunrise Ski resort. Contact owner if interested in playing 18 holes of golf in the White Mountains on a pristine course nestled among the Ponderosa Pines. Master bedroom downstairs, 2 guest bedrooms upstairs, high wood ceilings, large windows, large front and back porches. Full kitchen, high speed wireless. Great little get-a-way. Check out time 10:00 AM please. We live in Tucson and enjoy weekend getaways in our family cabin in the Pinetop CC area. We have been spending weekends and vacations in Pinetop since our kids were young, watching them grow up making forts, skiing, hiking and enjoying mountain adventures. We purchased this cute cabin 'Happy Hideaway' for a short term rental. The floor plan is wonderful for family time in the living room around the fireplace or sitting on the front or back porch to enjoy afternoon rains in the summer. The Pinetop Country Club areas is a great getaway location in the White Mountains, close to town or Sunrise Ski resort. Happy Hideaway is located in a nice quiet neighborhood, sounded by the forest. There are lots of places to walk, enjoy the trees, or just relax in a home away from home. The living room and dining area are part of the Great room with high ceilings and a gas fireplace. Cabin was well supplied and we had a wonderful holiday weekend for our family. Denise was very nice. Wonderful getaway for my 2 friends and me! The cabin was comfortable and felt like home! I would highly recommend this vacation home! It is located in a very quiet, beautiful and serene area. Wonderful opportunities to see the Wildlife: squirrels, Stellar Jays, Finches and woodpeckers! We had an amazing time. The cabin came equipped with all necessities and was very comfortable. It’s a great location. We enjoyed the peace and quiet and near by lakes! Thank you for an amazing weekend! We are so glad you had a wonderful time in the cabin and up in the mountains. You are welcome back anytime. When we opened the door, the fireplace was lit and the living room was so beautiful and inviting! We had a wonderful stay. The beds were comfy and there were so many extra pillows and linens available if needed. Although the back porch is very small and there was no patio furniture, we quickly found some chairs in the garage and enjoyed the beautiful front porch. The kitchen had all the necessities and more. Denise and Guy were gracious hosts and sent great directions for the lockbox for arrival. The cabins are fairly close together, but the neighborhood is quiet and we liked hearing the wind in the trees. It snowed on the morning we left and we wished we could stay for longer. Thank you, Denise and Guy, we can't wait for next time.